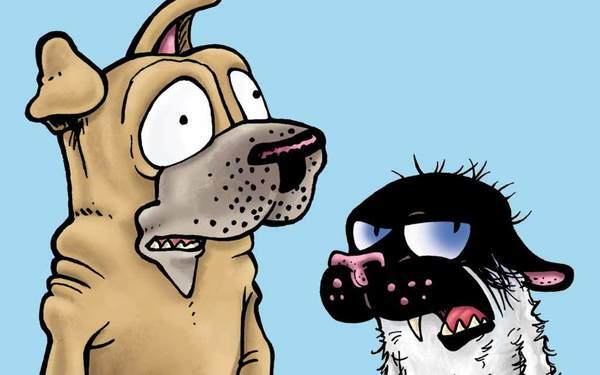 Housecats are known to be aloof, but "cat-titude" reaches new heights in Get Fuzzy, the bitingly hilarious comic strip from cartoonist Darby Conley. Available daily and Sunday and appearing in 650 newspapers nationwide, Get Fuzzy is a wry portrait of single life, with pets. At the center of this warm and fuzzy romp is Rob Wilco, a single, mild-mannered ad executive and guardian of anthropomorphic scamps Bucky and Satchel. Bucky is a temperamental cat who clearly wears the pants in this eccentric household. Satchel is a gentle pooch who tries to remain neutral, but frequently ends up on the receiving end of Bucky's mischief. Together, this unlikely trio endures all the trials and tribulations of a typical family... more or less. The National Cartoonists Society honored Get Fuzzy with a Reuben division award, naming it the Best Newspaper Comic Strip of 2002. There are a dozen Get Fuzzy compilation books published by Andrews McMeel: The Dog Is Not a Toy (House Rule #4); Get Fuzzy 2: Fuzzy Logic; Groovitude: A Get Fuzzy Treasury; The Get Fuzzy Experience: Are You Bucksperienced; Bucky Katt's Big Book of Fun; Blueprint for Disaster; Say Cheesy; Scrum Bums; Loserpalooza; I'm Ready for My Movie Contract; and Take Our Cat, Please; plus Get Fuzzy wall and box calendars.